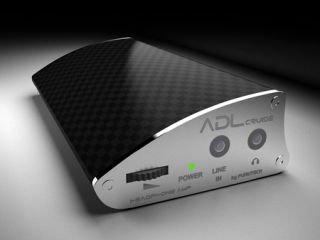 UPDATE: Cruise headphone amp from Alpha Design Labs now on sale for £375 | What Hi-Fi? This new Cruise headphone amp from Alpha Design Labs by Furutech, first unveiled at the Munich High End Show in May, is now available in the UK for £375. It's being distributed by Sound Fowndations in Blackwater, Hampshire and is designed for use with computers and portable music players. Full details in our original story below. The Munich High End Show runs from May 19-22, and we've started to get a trickle of information about product launches planned for the event. First up is a new headphone amp, the Cruise, from Alpha Design Labs by Furutech. Designed for portable use, it connects to your laptop or portable music player and is powered by its built-in rechargeable battery. When hooked up to a computer via USB it will recharge the battery. Finished in carbon fibre and mirror polished stainless steel, the device fits in the palm of your hand and can be used for listening to music on the go, or while at home. There's an on/off switch, volume control, 3.5mm and 24/96 USB inputs, it can be charged via an AC/DC adapter as well as USB, and includes a 3.5mm headphone output. For occasions when USB connection isn't possible, Alpha Design Labs has developed a special 3.5mm stereo analogue cable, the iD35SP (right), with gold-plated connectors and a silver-plated OCC conductor. We'll bring you full coverage of the Munich Show next week, so check back on whathifi.com from May 19th for all the latest news.